Combining these events with other notable recent weather events ... Hurricane Sandy (largest Atlantic storm measured by diameter), Hurricane Patricia (strongest 1-minute sustained winds on record) and the significant flooding in Myrtle Beach partly caused by Hurricane Joaquin ... and it certainly gives pause to consider the possibility of whether Bill Nye is correct, that these events are linked to climate change. First time a lead off batter hits inside-the-park home run to start a world series. Longest game 1 in history of world series. NY Mets Daniel Murphy became the first player to hit a home run in six consecutive playoff games. Chicago Cubs set a record for most home runs hit by a team in a single playoff game (6). Wrigley Field in Chicago got its first playoff series win since opening 100 years ago. Most post-season home runs on a single day (21). Most post-season total runs on a single day (61). Kyle Schwarber set a record for the most post-season home runs before turning 23 years of age. Alcides Escobar sets the longest hitting streak in a single post-season (15 games). Royals set single postseason record for the most comeback wins after trailing by multiple runs (7). Royals were the first team to score 5 runs in an extra inning of a world series game. Royals only team in history to win 3 world series games after trailing the 8th inning or later. Royals most runs scored in the 7th inning or later in a single postseason (51). Now, did major league baseball change during 2015? Of course not, same rules and same baseball fields. Yet despite the lack of significant changes to the sport new records are made in baseball every year, and it doesn't require a change in the nature of baseball to do so. As mentioned above it's a statistical inevitability. As the sample size increases chances are something extreme will happen. Here's another way to look at it, this time using analogies from other areas. For example, the more days you spend driving in a car the more likely over time it becomes that at some point you'll get in a car accident. The more rounds of golf you play the more likely it is that some day you'll make a hole-in-one. The more times you spend outside in a thunderstorm the more likely it becomes that one day you'll eventually get struck by lightning. The more days you invest in the stock market the more likely it will become that your money will be subject to a market crash. Similarly, with thousands of cities around the world, chances are weather records are going to be broken somewhere on the planet in a given day/week/month and it doesn't mean that the climate is changing. That is the point I hope to drive home with this post, and the point that is lost by many who talk about climate change. New records and strong storms do not by themselves equate to climate change. 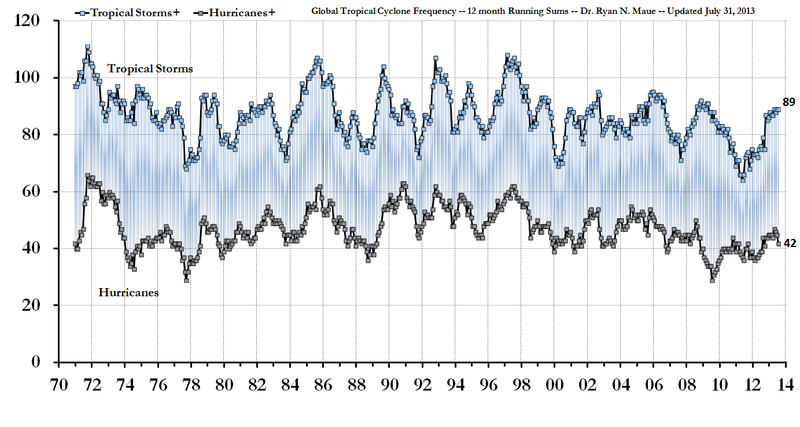 To assess whether the climate is changing the long term frequency trends must be plotted. For example, here is a plot of violent tornadoes vs. year. Note that there is no increase in the number of tornadoes over time. Here's one for global tropical storms and hurricanes. Again note that there is no trend in these storms over time. So, as much as Bill Nye wants to preach climate change is responsible for all the recent storms, unfortunately there is no signal in the data to support his tweets.